How to Pass Style Me Girl Level 28, "Carnival," & Get 3 Stars With No Cash Items! | I Style Me Girl! 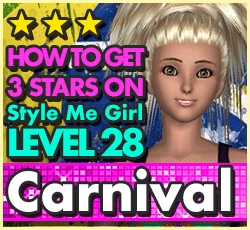 How to Pass Style Me Girl Level 28, "Carnival," & Get 3 Stars With No Cash Items! Let your freak flag fly in Style Me Girl Level 28, "Carnival," theme with model Lara. Those are the instructions, and that's what I did, dressing Lara up in bright colors and keeping her own crazy big ponytail up-do! Using no cash items, I was able to pass and get three stars. If you would like to know how to pass Style Me Girl Level 28, "Carnival," theme you've come to the right place. 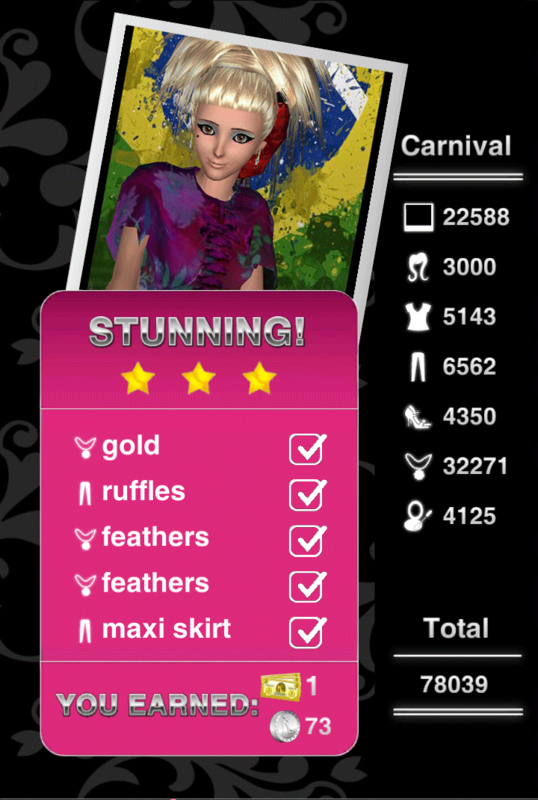 The items I used to earn 3 stars on Style Me Girl Level 12, "Carnival," are pictured and described in the list below. The "Closet Items," screen capture image at right can be clicked to enlarge if you'd like a more detailed view. DRESS: African/Jamaican ( I think ) Flag dress. Full sleeved. MAKEUP: blue and pink eye shadow with winged liner and beauty mark. Lipstick and Mascara that comes with game .